If you’ve read some of our previous posts, you’ll realise that I have a rather large addiction to sea turtles. It’s a weird addiction to have I must admit. Of course, it’s not my only one, travel and chillies are two more; but don’t worry, in this post I’m only going to talk about sea turtles! 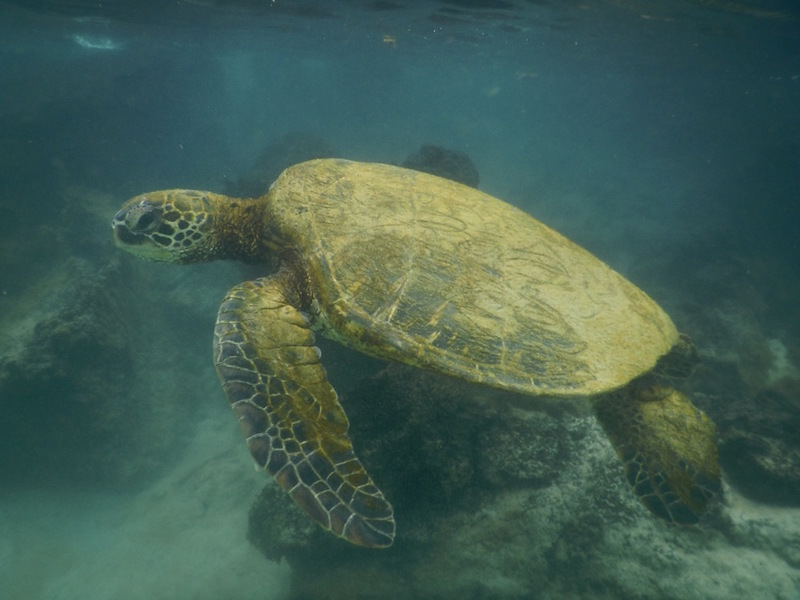 The first time I swam with sea turtles was in Akumal in Mexico and I was hooked straight away! Swimming with those beautiful and peaceful creatures was both magical and incredibly relaxing. I could have spent hours watching them munching on sea grass, gliding slowly through the water on their way to the next rock; and occasionally popping up for air. Swimming with turtles really is an experience to be treasured and although I’ve done it many more times since then, I’ve never tired of it. 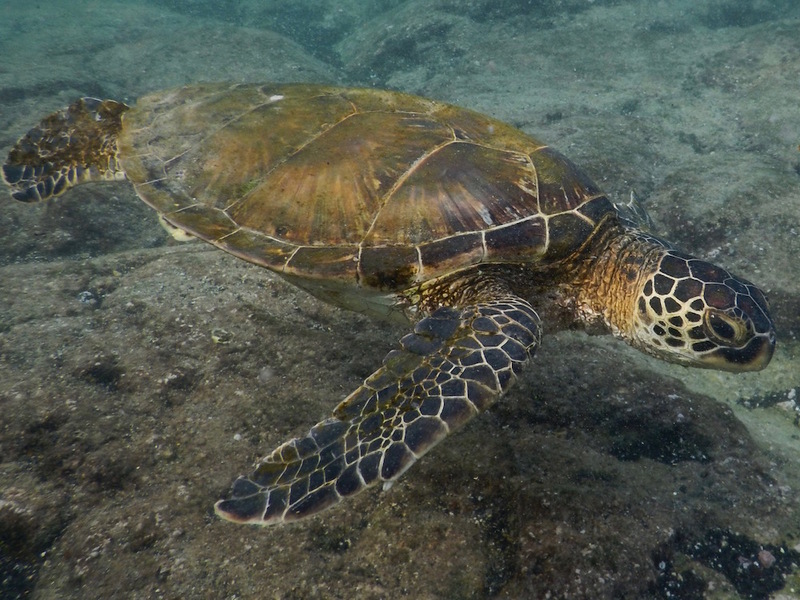 An Hawaiian sea turtle (Honu). This was our favourite beach. The beach itself is nothing special, especially compared to some we have in Australia. But that’s not the reason we went there. We wanted to see sea turtles, and we saw a plenty. Lots and lots of them. You could even easily see them frolicking in the water as you stood on the shore! A turtle munching on the sea grass in Kahalu’u Beach Park. 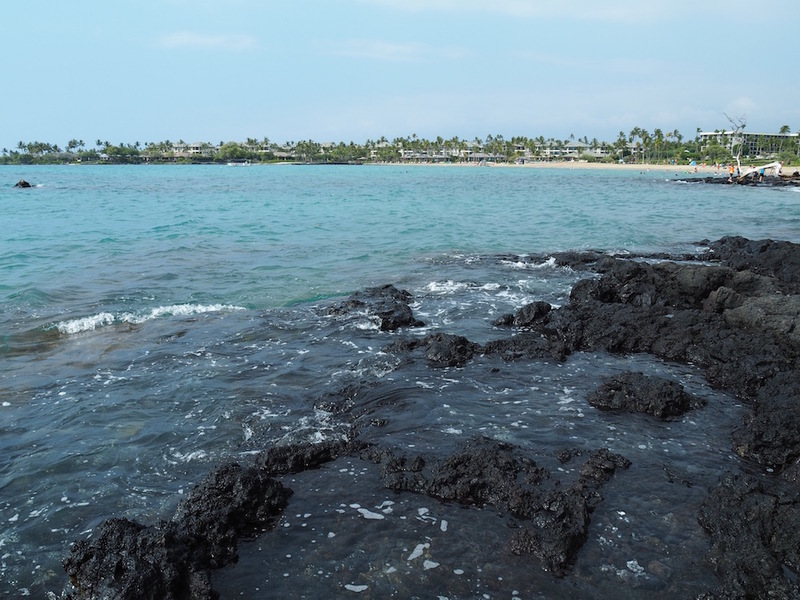 We stayed at Kona Magic Sands which was just a five-minute drive from this beach, so we went there every day while in Kona. Every day we saw turtles and not just one but three, four or five of them. 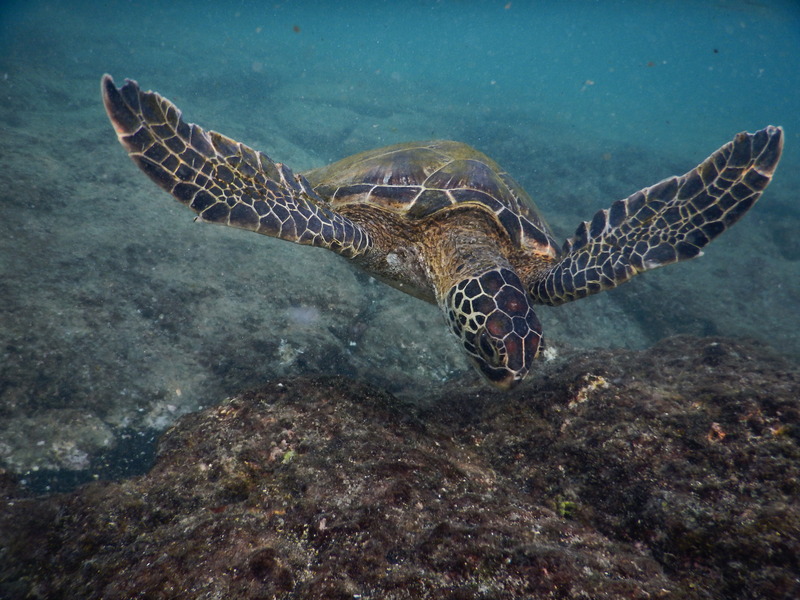 At Kahalu’u Beach Park you can even see turtles when standing on the shore. This beach is also good for beginner snorkelers as the water is quite calm if you stick to the southern side. There is a rock wall there that protects the beach from any large swells. The northern side has some stronger surf, so if you’re not a turtle addict like me and you tire of snorkelling, you can head over there to learn to surf! Location: 15 minutes south of Kona on Alii Drive. This place is more like a park than a beach. Instead of sand, there is a beautiful grassy area. To enter the water you either climb down from the rocks or use one of the ladders. The best place to see the turtles is on the right-hand side of the park. There you’ll find a small sheltered inlet where you’ll feel like you’re swimming in an extra large swimming pool. 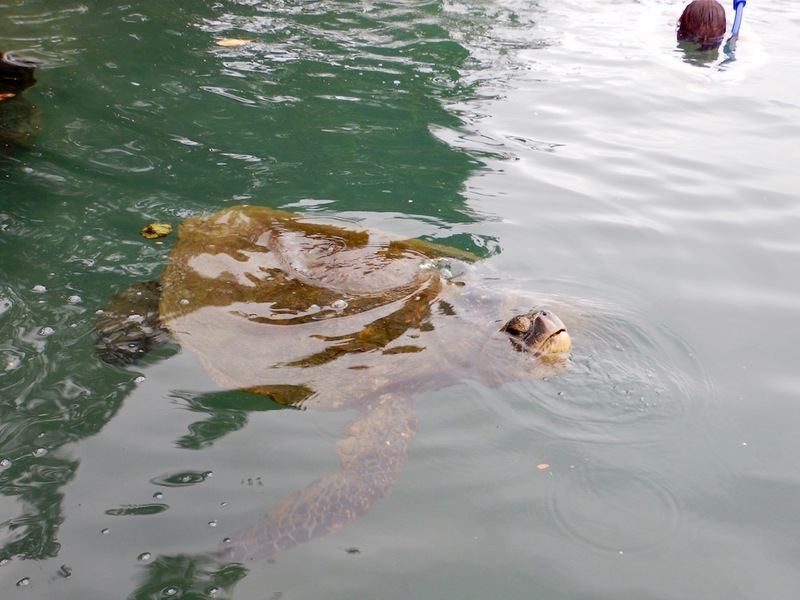 Bear in mind that two of the sea turtles that live in this park are huge; yes really huge. But don’t be scared, they are super friendly and are so used to people that they almost follow you around. Remember even if they come up to you, don’t touch them! You can also see them while standing on the shore. In fact, as we exited the water, one of these huge turtles appeared from under a rock ledge and did a little show just for us for several minutes. This turtle was doing exactly what our dogs do when they want attention, patting the rock we were standing on with his flipper, just like our dogs paw our legs for cuddles. So cute. A friendly turtle at Carlsmith Beach Park. Swimming with huge turtles at Carlsmith Beach Park. A friendly turtle popping up to say hello. The water at this beach park was colder than in any other place we swam at in Hawaii. If like us you are there in winter, you may prefer to wear a rash vest to keep you warm while you swim. 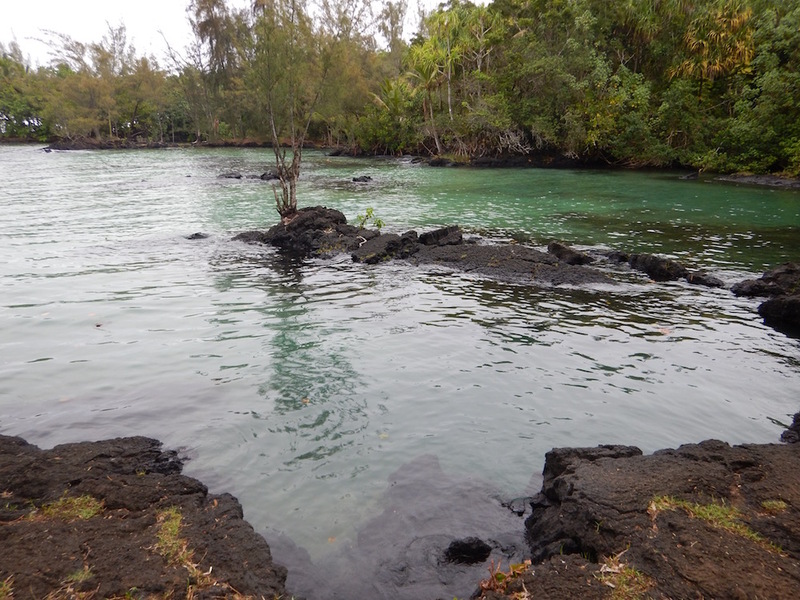 Location: 10 minutes from Hilo going towards the airport on Kalanianaole Avenue. It is located right behind the airport. 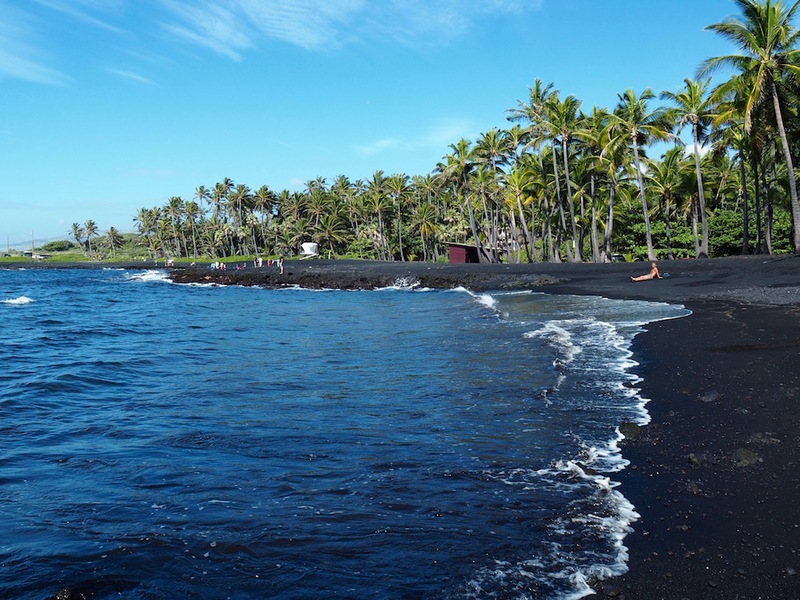 This beach is not only the most beautiful black, sandy beach on the Big Island, but it is home to lots of sea turtles. Sometimes, you may even see them basking in the sun. Sadly we didn’t see any out of the water on our visit, but standing on the rocks we could see many swimming out in the surf. The waves were too rough for us to go snorkelling, so we just enjoyed them from the shore. The sign at the entrance to the beach. The beautiful black sand beach. Location: This beach is on the South-East shore of the island. It is about forty minutes from the Volcanoes National Park and an hour and a half from Kailua-Kona. After a long and relaxing lunch at the Lava Lava Beach Club (located on this beach) I decided to go for a walk along the beach. Needless to say, I didn’t have to walk more than a few metres before being distracted by sea turtles swimming right next to shore! There was at least four of them on the right-hand side of the restaurant. They seemed to attract a bit of a crowd as everyone decided to enjoy their show. Next I went for a walk further to the left of the restaurant. Again I didn’t have to go far, as more turtles had gathered to feed in the rocks close to shore! We were told they are also sometimes seen basking in the sun around that area. 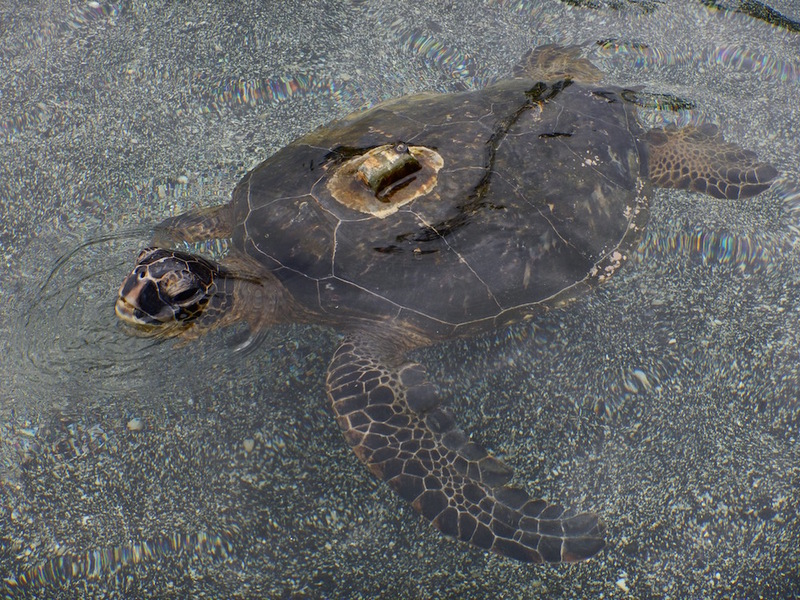 This is a great place to head to combine turtle watching, a long, lazy lunch and a Coconut Mai Tai or two! Location: 30 minutes north of Kona, off highway 19. 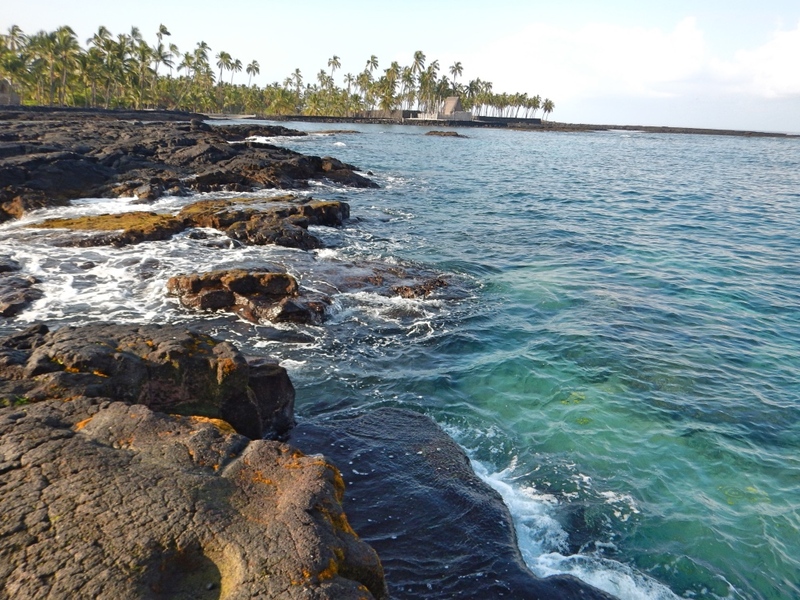 This rocky bay right next door to an ancient Hawaiian place of refuge is one of the best snorkelling spots on the Big Island. Here you’ll find many different species of fish congregating in the extremely clear water close to shore. 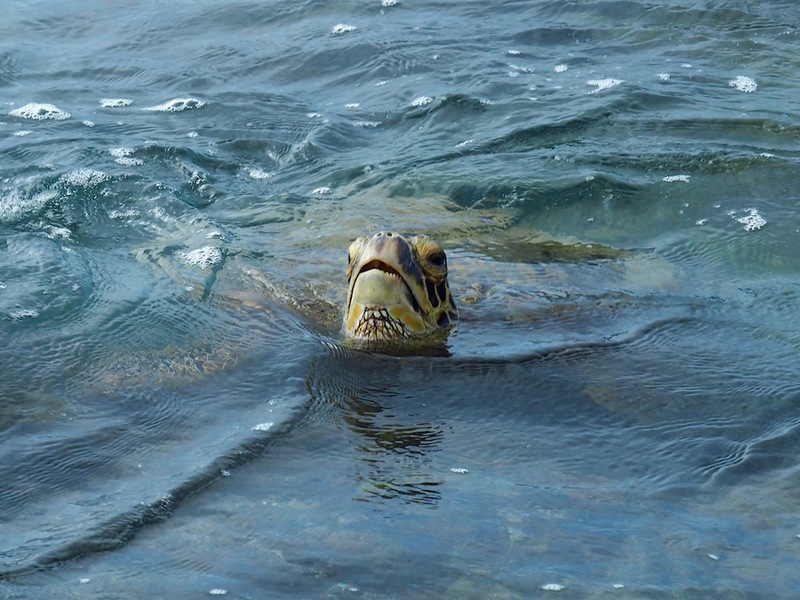 Sea turtles also like to hang out in the bay and might come and join you as you snorkel. We had the pleasure of seeing one while there, along with two Moray Eels and thousands of fish. The trick is to get there really early before the crowds arrive. Dolphins are also known to occasionally give snorkelers a bit of a show here. 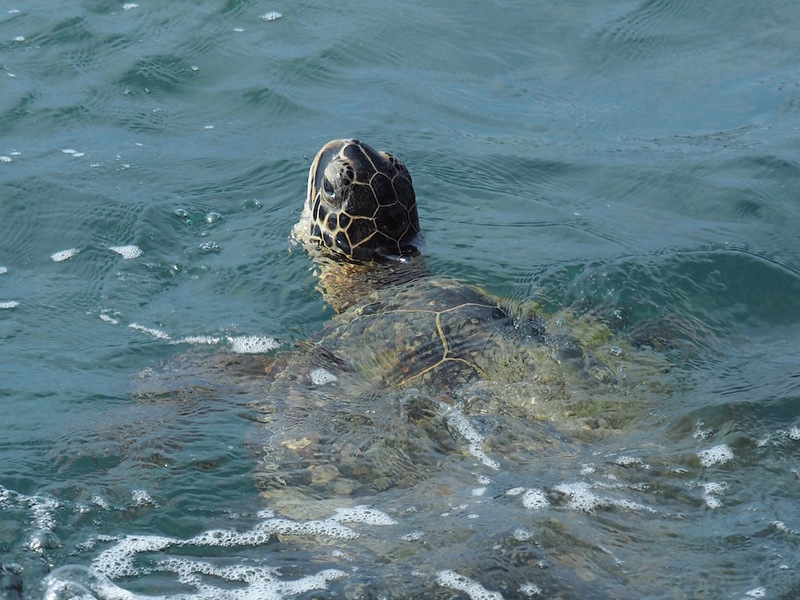 Sea turtle spotting at Honaunau Bay. Location: 20 miles south of Kona. I can’t stress this enough but please, please don’t touch the turtles. Not only it is illegal to touch them in Hawaii, but at the end of the day although they are friendly, they are still wild animals and you need to respect that. Stay at least two to three meters away (six to ten feet) from them. Yes sometimes that’s hard to do if they follow you around but at least try. Do not feed them! They have their own diet and what you eat is not what they eat! You’ll end up making them sick. Do not chase them; they will decide if they want to come near you or not. 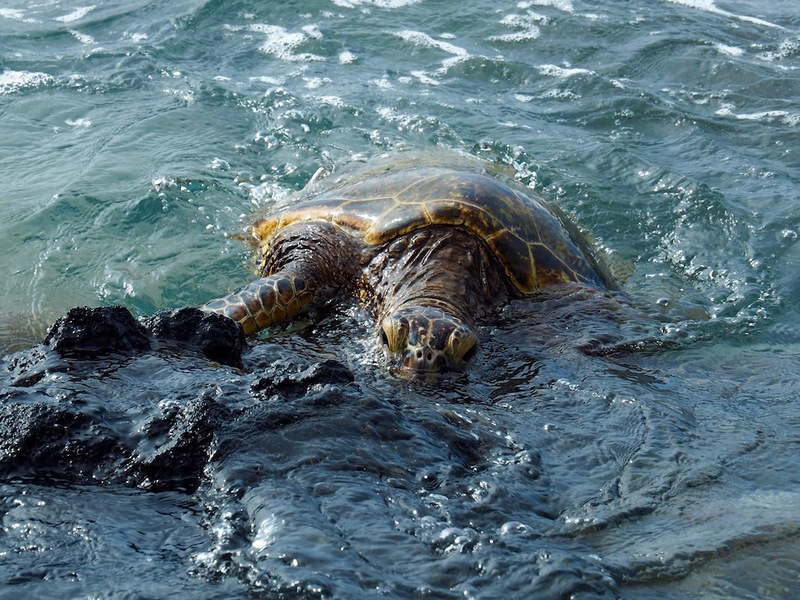 Hawaiian turtles are some of the friendliest turtles around but even they tire of too much attention. Just keep your distance and let them go about their business. Do not swim above a turtle. Turtles need to come up for air occasionally. If you swim right above them it prevents them from being able to do that. If you see a turtle basking in the sun, do not disturb it. Would you like it if someone came and bothered you while you slept? Probably not; and neither do they! 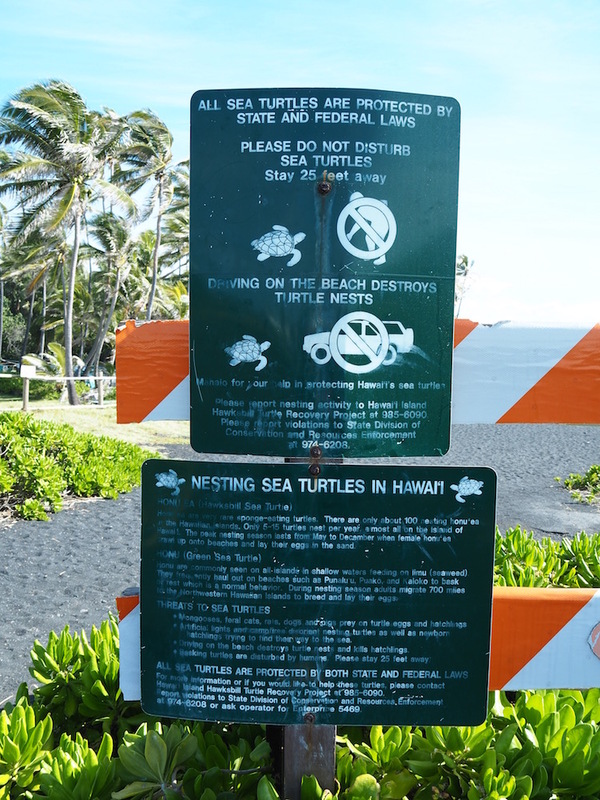 Turtles are protected by the state of Hawaii and by federal laws, so if you don’t want to get a fine, please follow these rules. 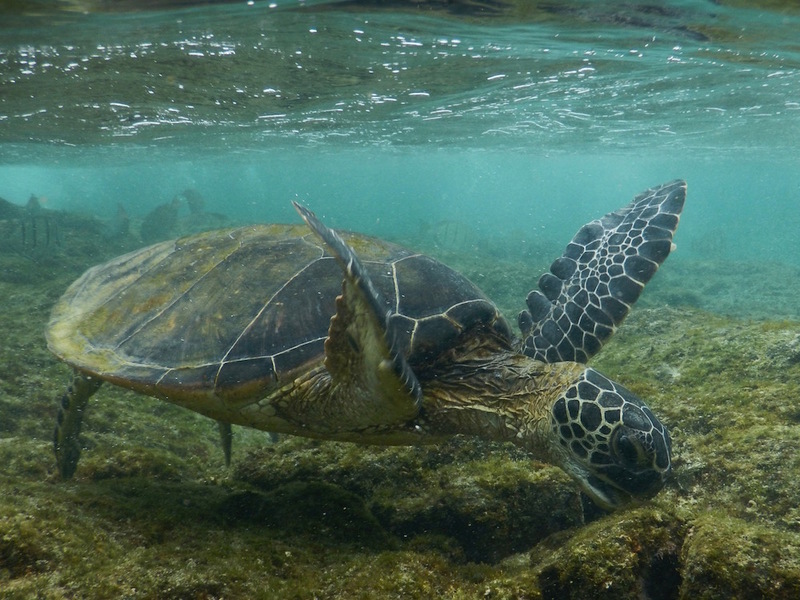 Hawaiian people love their turtles, they respect them and they care for them. So let’s respect them too. That way we can enjoy them for much longer. 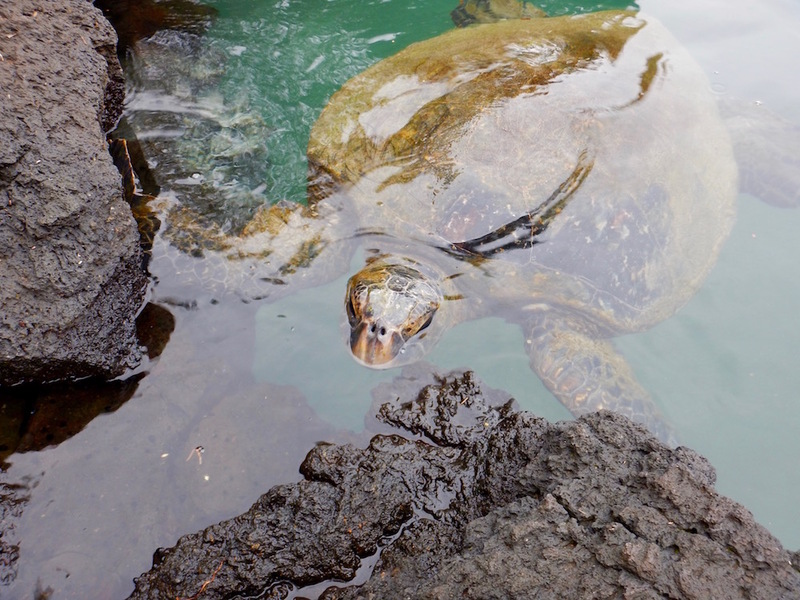 The Big Island is really large and I’m sure there are plenty more great places to see sea turtles. If you know of any that we missed, please leave us a comment below telling us where, so we can check it out on our next trip. To read about our week on the Big Island click here. 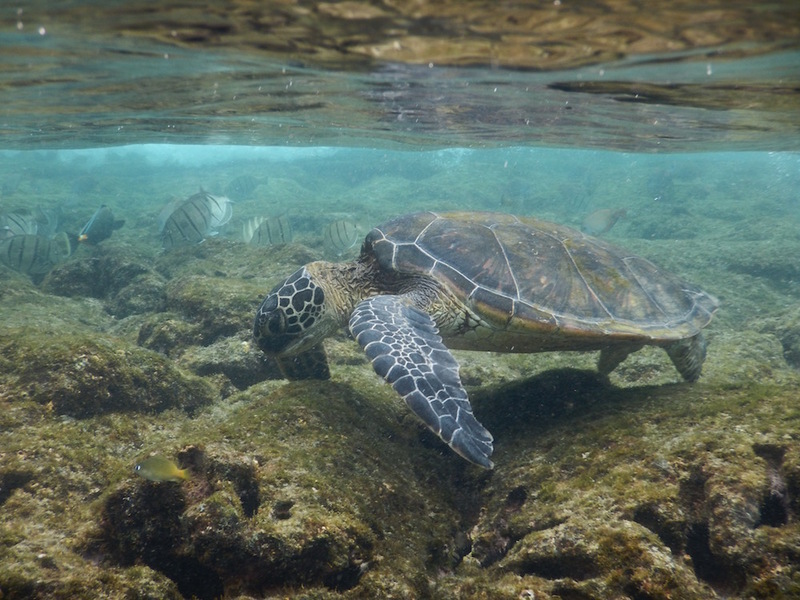 Find out about our favourite snorkelling spots in the Hawaiian Islands here. Find out What to Pack For Your Next Snorkelling Adventure click here. I love swimming with sea turtles too. The first time I did was in the British Virgin Islands. I haven’t been to the Big Island yet, but I want to go. Saving this for when the time comes! Thanks Lara, I’d love to visit the British Virgin Islands too. I bet the snorkelling was amazing there? Awesome and super detailed guide. I would love to see a sea turtle too. In my bucketlist now! Hi Long, in Kahalu’u Beach Park you do not need to take a boat. We saw turtles standing on the beach the first time we went! But if you go snorkelling off the beach you will more than likely see one of two if not more. The kids would love it! We are yet to try out this adventure. The turtles sound like amicable creatures and swimming with them would be fun. Your pictures of turtles are awe-inspiring. Thanks Rashmi, yes the turtles were super friendly. Glad you enjoyed the photos.